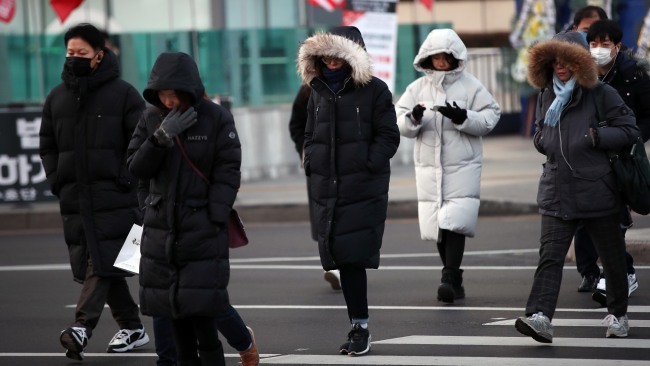 The Korea Meteorological Administration issued a cold wave alert for much of the northeastern province of Gangwon, where the mercury fell as low as minus 23.5C in mountainous areas. Temperatures in the province's Cheorwon, Daegwallyeong, Chuncheon and Wonju plunged to minus 23.4C, minus 18.9C, minus 15.4C and minus 12.5C, respectively. The weather administration forecast Seoul's daily high to remain below 4C on Friday. It said the cold spell is expected to continue through this weekend. "The temperature will drop below minus 10C and the daytime temperatures will stay below zero in most parts of the country until Sunday. Due to strong winds, the wind chill temperatures will be much lower," a KMA official said. Temperatures are generally higher in the nation's southern regions and Jeju Island, where the mercury stood at between minus 5C and 0.8C, but snow fell or will fall there later in the day. As the freezing temperatures have lasted for a few days, citizens in Seoul went to work in thick winter jackets. Except for commuters, there was a noticeable drop in pedestrians on streets, while few people went out for walks in urban parks.